ASUS USB-N13 gives you a powerful and on-the-go connection with its hassle-free setup. Its specially-designed internal antenna provides wireless speed up to 300Mbps and wireless coverage of up to 300 meters. It also provides you with Software AP and Xlink Kai applications and supports multiple OS including Windows, Mac OS X, and Linux. 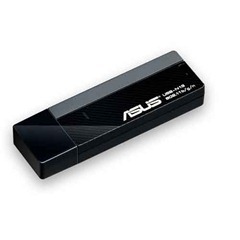 Notice: The driver & utility is for Asus USB-N13 B1, not for Asus USB-N13, their wireless chipset is different.